Where to begin with this amazing family… I have gotten to work with them several times as their Family Milestone Photographer. And let me tell you – they are so fun to be around! I love love love spending time with these ones. They are such optimistic people, and their positive outlook on life is so inspiring. During this session, we celebrated three things in one – this sweet couple’s anniversary, their son’s first birthday, and the love that they all share in between! We chose to do this shoot in the beautiful outdoors with a sunset background. The lighting was absolutely perfect. 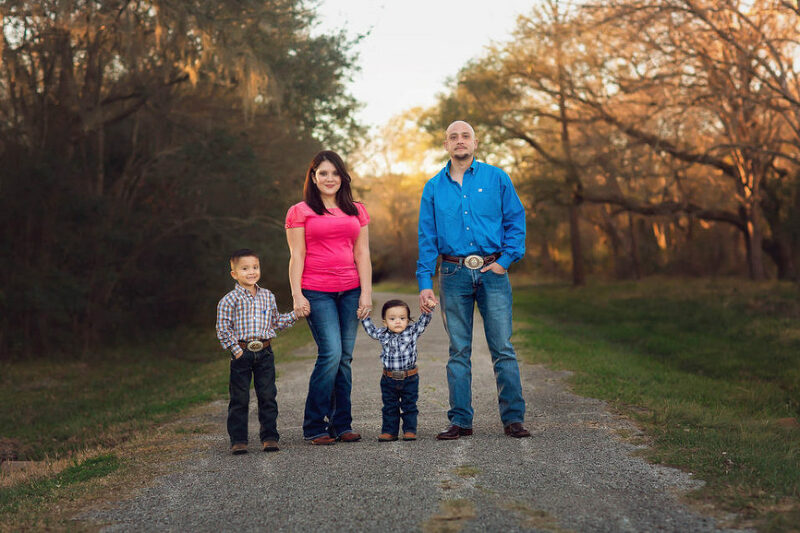 The family stood on a worn out road, and it really tied in well with their country style wardrobe. The little ones looked so precious with their plaid shirts, belt buckles, and boots! The Banda family means so much to me, and I feel so blessed to know them. They are so quick to invite me to be a part of their family photos. They now have five canvases from their sessions with me. It is families like this one that make me love what I do! I thank God everyday for the amazing impact my clients have on my life! I loved working with these beautiful people. The love they share is always such a sweet treat to capture. I can’t wait to see what the future has in store for them! Make sure to check out more gorgeous children and baby sessions from Cherish This Photography. Interested in booking your own milestone session? Let’s chat! Ashley of Cherish This Photography is a Heights child and family photographer located in Houston, Texas. Ashley creates fine art, heritage images of expecting moms, newborns, and the families that love them. Serving Houston, Pearland, Heights and surrounding Texas communities.